Ed Struijlaart was a guest on the show of Eefke Boelhouwers at Omroep Brabant radio today. I always like it when we have live music, not only because I like mixing it. Ed brought only his guitar with him, so he performed (semi) acoustic. Later that the, it would became clear that a unique backstage video was being made. Ed has discovered a new feature of Facebook: streaming live video. Followers of his account on Facebook can also react immediately on the video, and that gives a lot of interaction between Ed and his fans. Arriving at Omroep Brabant he starts filming at the parking lot. The welcome, soundcheck, the interview and the final performance: you now can experience it all by yourself! A unique view behind the scenes. Of course, Omroep Brabant also shot the performance by itself. Nowadays, one can view radio. Using ‘visual radio’ you can have a live look in the radiostudio using internet. Here you can find the video of the song Anything as it was broadcasted on the radio and internet. But as stated before, also Ed made a movie, backstage. From the moment he arrives at the parking lot of the Omroep Brabant studio’s until the moment he packs his guitar, Ed gives you a unique view behind the scenes. If you are curious how things work, you should definitely have a look. Of course there was also time to do a little interview on the radio. Ed explained he wrote the song Tricks up my sleeve ten years ago, but due to the encouragement of DJ Rob Stenders he released it once again. In his own studio he made a 2016-version of the song. 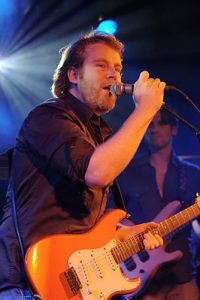 Using social media, Ed Struijlaart contacted the drummer that is working with John Mayer, who, at his studio in Los Angeles recorded the drums from the song. Plagiarism @ Eurovision Song Contest?